Florence will be hosting a free one-hour cooking class at Macy's Cellar in Union Square, where he will instruct the general public how to make some of his favorite signature dishes as well as some newer twists on old classics. Attendees can look forward to making Florence's One Pan Lasagna, Peach Rice Pudding, and other treats -- all for free. However, since it's open to the public, Macy's Cellar recommends calling to make reservations in advance. It's located at 170 O'Farrell St., and the reservation number is 1-800-786-2665. Casual dress is preferred -- no need to bring a knife roll or chef's hat, although Florence will likely be on hand to sign cookbooks after the class has finished. The event is scheduled from 6 to 7 p.m. on Wednesday, June 29. The chef and restaurateur behind the new Wayfare Tavern is the host of Food Network's Tyler's Ultimate as well as past shows Food 911 and How To Boil Water. 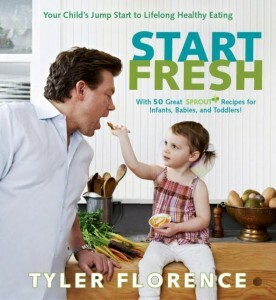 He's also a best-selling cookbook author with seven titles to his credit, one of which (Start Fresh: Your Child's Jump Start To Lifelong Healthy Eating) was just published this month.